Recently a very useless piece of golf literary paraphernalia has been brought to my attention. 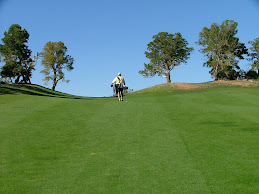 It is a survey piece on GolfDigest.com that delves into Golf's 'Other' Rules. These are not the sacrosanct rules of the game so meticulously elaborated by the USGA and the R&A. Rather these are the nuances of etiquette that we encounter everyday at every golf courses. THOUGHT: Frankly, if you want to wear bluejeans and a tee shirt and play golf, find an empty framer's field and have a go. 18% of all courses that allow cell phones forbid their use on the golf course. THOUGHT: If you really need to use your cell-phone, stay off the golf course. THOUGHT: If a golf course informs you that carts are mandatory, you know that course does not have the game of golf at heart (nevermind your own heart-health). You'll know it's all profit motive. Find another track for your ball. There's more in the survey, so have a read. It's fun but it will also stir your interest.